Known from a picture in the St. Louis Post-Dispatch. It appears that the picture of the band on inside cover of No Depression was taken from this show as well. Soundboard recording. UT played two acoustic sets to a sparse crowd, with an open-mike set in between. The tape is of the first set. Local barfly Freddie Friction sat in on spoons for some of the set. This show has previously been listed as "Songwriter's Night, '89 or '90." Opening for the Something Brothers. Billed as an acoustic set, and the existing tape is all acoustic, but several attendees remember that they plugged in for much of the night. Contains the only known performance of Bob Dylan's "Song to Woody." 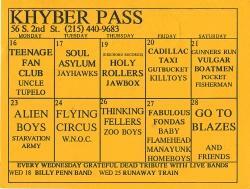 Brian Henneman also played a few songs solo (no tape of his set has circulated), and it was at this show that he announced that Chicken Truck had broken up. 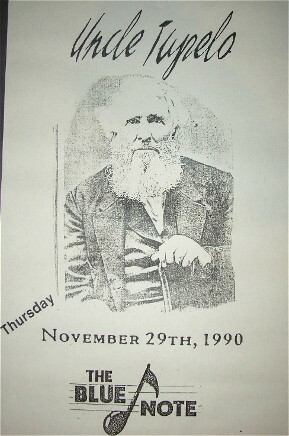 The first night of two-night stand marking the release of "No Depression." Opening band was the Hilltops, featuring John Stirrat, later of the expanded Uncle Tupelo line-up and Wilco, and Cary Hudson, later of Blue Mountain. They played as a trio that night because Laurie Stirrat (also later of Blue Mountain) was sick. 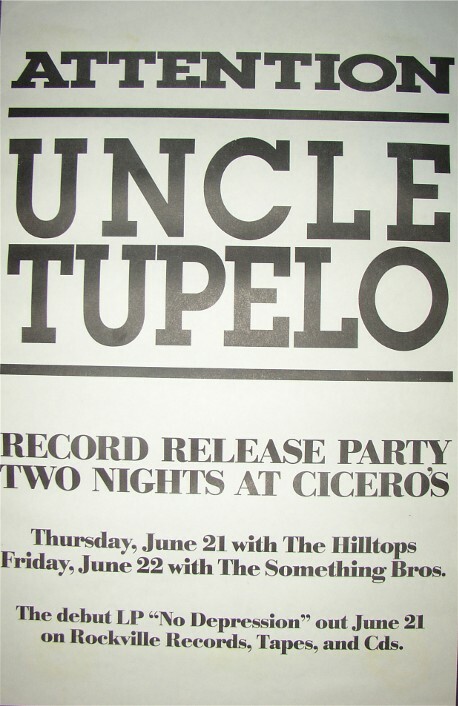 Rockville Records reportedly offered The Hilltops a record contract after this show. Second night of the record release party for "No Depression." Opening band was The Something Bros. Opened for Teenage Fanclub, whose band history on their website describes them "playing in the window of an empty bar in Philadelphia with Uncle Tupelo." FM broadcast. Great acoustic performance, as well as an awful interview. Source for the acoustic version of "Looking For a Way Out" on the "Sauget Wind" 7-inch and Anthology, as well as the acoustic "Whiskey Bottle" on the reissue of No Depression. Soundboard recording. Benefit show for Gary Morris. Also on the bill was Chicken Truck, who had disbanded earlier in the year but got back together for a "reunion/farewell" set that was broadcast on KDHX in St. Louis. Uncle Tupelo's set was not broadcast. Texas Instruments and Balloonatic opened. In-store show. There was probably a club show that night, most likely at Lounge Ax. Opened for Buffalo Tom as part of the CMJ conference. Soundboard recording, unfortunately several songs are incomplete on the tape. Great performance. Audience recording. Great set with lots of off-the-cuff covers. 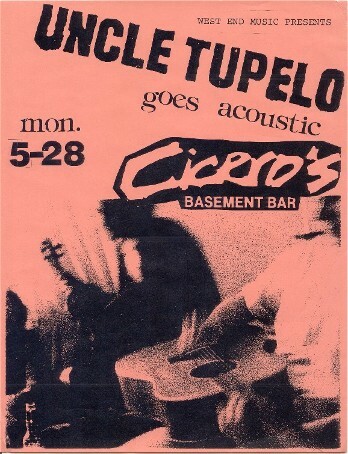 This was their last headlining show at Cicero's as Uncle Tupelo. FM broadcast. The band, along with Brian Henneman (aka Crisco Austin), plays call-in requests from listeners. Excellent soundboard recording of a great performance. Tragically, the tape ends during the first verse of "Cortez the Killer." Mike Heidorn mentioned in an article in the Belleville News-Democrat in early 1991 that they played in NYC nine times in 1990.